Last week, we attended a Boy Scout fundraising auction. 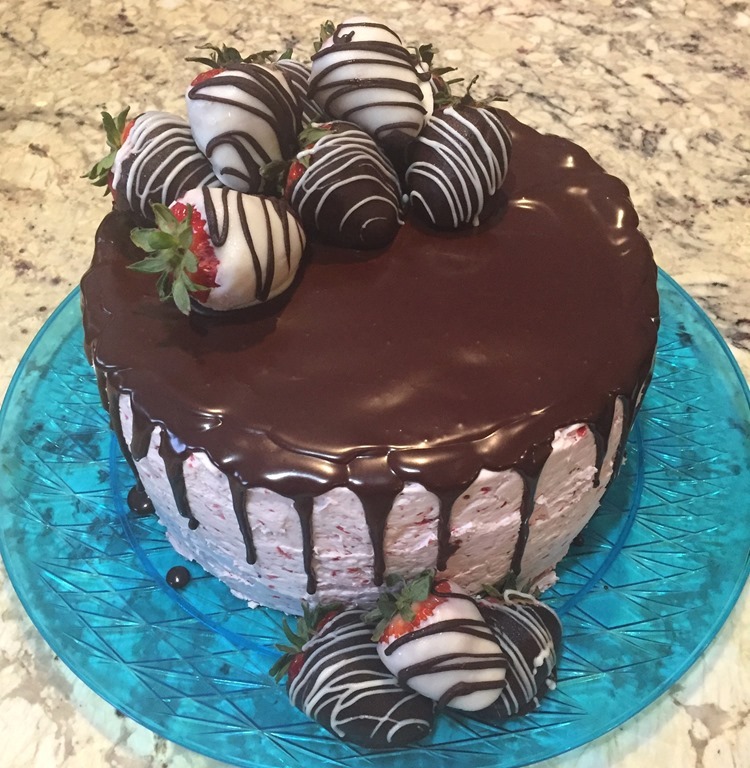 I made a few items to contribute, including this Chocolate Covered Strawberries Cake. It is a 4-layer chocolate cake filled with Strawberry Swiss Meringue Buttercream icing. And garnished with chocolate covered strawberries. 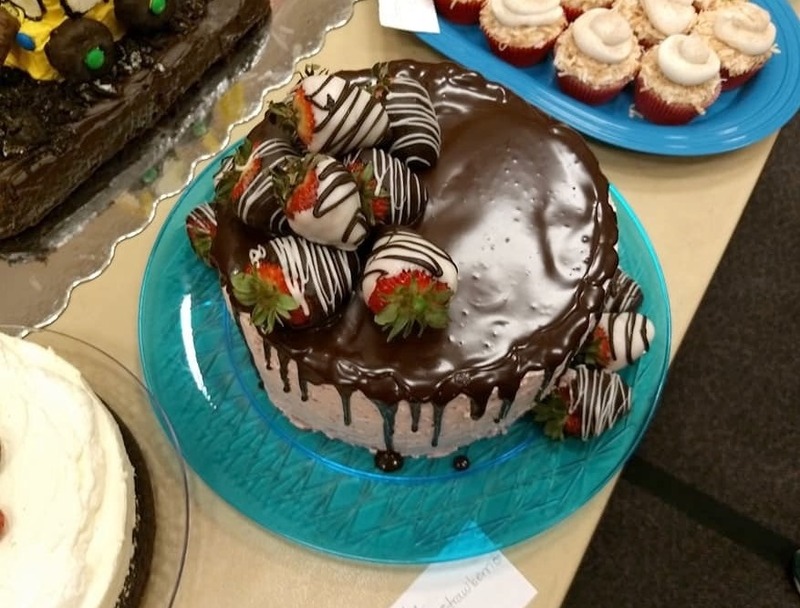 There were sooo many delicious looking desserts at the auction. Not a good time to be on a low-carb diet. Transfer the egg white mixture to the bowl of a stand mixer. With the whisk attachment, whip until meringue is completely cooled and glossy peaks form, about 10 minutes. DO NOT ADD BUTTER UNTIL BOTH THE BOWL AND FROSTING ARE COMPLETELY COOL. Switch mixer attachment from the whisk to paddles. Add butter 1-2 Tablespoons at a time until incorporated. Mixture may appear curdled at times. Continue beating until butter is fully incorporated and frosting is fluffy and smooth. This will take about 10 minutes. Add vanilla and beat smooth. Add strawberry filling and beat until frosting is a uniform color. **BUTTER NOTE: butter should be at room temperature soft, but not overly soft. If the butter is too cold, it will not incorporate well into the meringue, and you will have butter chunks. If the butter is over-soft, it will cause the icing to curdle while beating-this is okay, it isn’t ruined: it will just take longer (more beating) for the frosting to become smooth. If icing still won’t set, place in the fridge for 20 minutes, and then beat again. Process strawberries in a food processor until very finely chopped, but not completely liquefied. Mix in sugar. Place the chopped chocolate into a small bowl and set aside. In a Pyrex measuring cup or microwavable bowl, combine the heavy cream and corn syrup. Heat for 30-45 seconds; stir. Pour the hot cream over the chopped chocolate. Let sit for one minutes, then stir until smooth. Melt chocolate and vanilla melting chocolates in separate bowls. Dip strawberries in melted chocolate and place on waxed paper. Place remaining melted chocolates in Ziploc bags and poke a hole in one corner of each bag. Drizzle strawberries with contrasting chocolate. Let chocolate harden completely before placing on cake. Place waxed paper strips along edges of serving plate. Place one cake layer, cut side up, on the serving plate. Waxed paper strips should cover the exposed part of the plate, but not be too far under the cake layer. 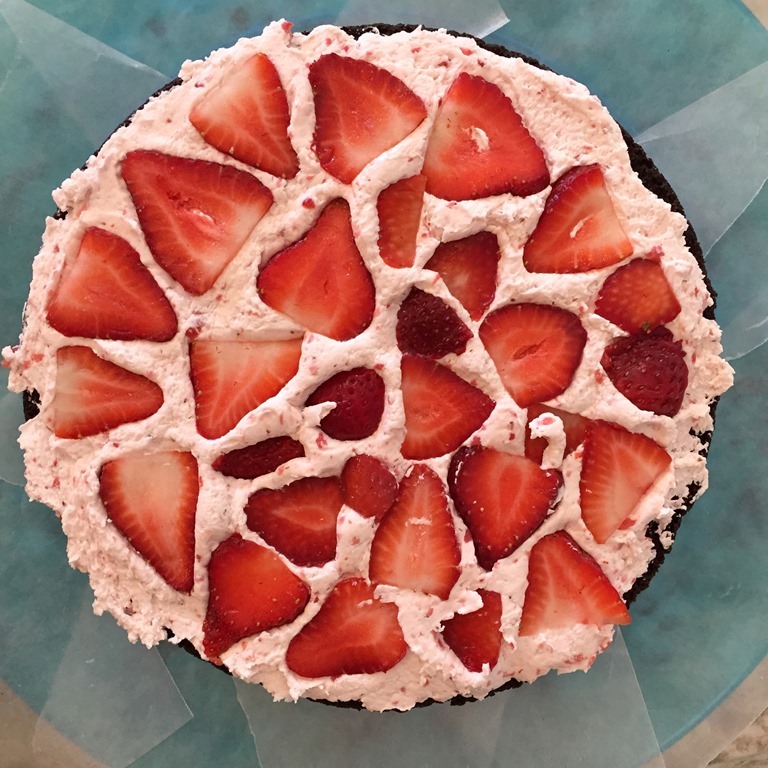 Spread cake with a layer of strawberry icing. Press sliced fresh strawberries into icing. Top with another cake layer. Repeat with frosting and remaining cake layers. Ice entire cake with a thin crumb coat of icing. Refrigerate cake for 2o minutes to set slightly (optional). Create a smooth finish with remaining icing over entire cake (top of cake should be completely flat). Drizzle cake with ganache, letting it drip down the sides. Refrigerate cake. Decorate top and base of cake with chocolate covered strawberries. Storage: Store cake in refrigerator.